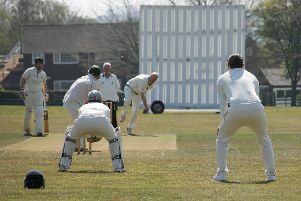 Market Rasen Sunday XI travelled to the farthest reaches of the county on Sunday as they faced Lincoln and District League Division Two rivals North Scarle. With a team filled with promising club juniors, the side was bolstered by the return of some familiar senior faces. Bowling first against North Scarle’s First XI, Rasen conducted themselves with great poise and resilience on an extremely hot day in the outfield. Reaching 243-6 from their allotted 40 overs, the home side will have been pleased to post a large total when looking back at Rasen’s previous batting performances this season. Joshua Sugden top scored for Scarle with an unbeaten 88 after openers Michael Jones (40) and Chris Geeson (51) had laid a solid foundation. But in reply, the away side were unable to mount a serious challenge and were bowled out for 88 inside 30 overs, wicket-keeper Reuben Pritchard top scoring with 20. Bowling: C. Janney 5-0-57-0; M. Quinlan 4-1-18-0; J. Snell 10-1-49-3; J. Quinlan 4-0-26-0; N. Keast 7-0-30-1; D. Mason 3-0-25-0; A. Quinlan 7-1-36-2. Market Rasen: N. Keast 12, J. Beastall, R. Pritchard 20, C. Janney 0, D. Mason 6, J. Snell 15, M. Quinlan 0, M. Bedford 3, J. Quinlan 4, A. Quinlan 9, Extras 17. Total: 88.